IFC penetration within commercial aviation is poised to accelerate in the coming years. Euroconsult estimates that, by 2027, the total number of connected commercial aircraft will reach more than 23,300 from approximately 7,400 at YE 2017. The penetration of IFC solutions for commercial aircraft is estimated to have reached more than 30% at YE 2017 and is expected to reach more than 63% by 2027. Out of the 3.8 billion passengers who used air travel in 2017, we estimate that almost 4% of them used in-flight wi-fi. Some regional markets are more mature than others. 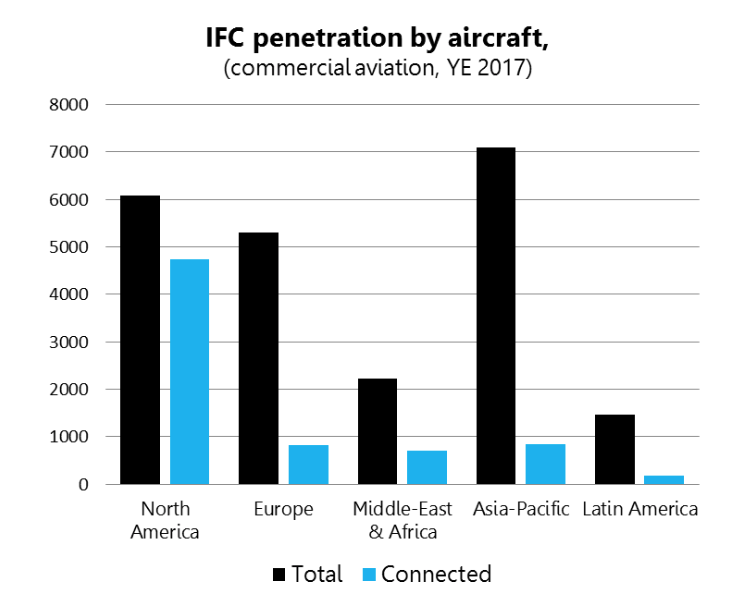 North America remains one of the most important markets in terms of the number of operated aircraft and this market is highly penetrated by IFC, with more than 78% of the fleet having an air-to-ground or satellite connectivity solution installed. The European and Asia Pacific markets are currently of great interest for service providers, with an IFC penetration of around 15% and 12%, respectively. These markets represent significant potential for in-flight connectivity providers. For the past years, IATA has reported enormous passenger growth in the Asian market and especially in the domestic Chinese passenger market. Passenger markets such as India, Indonesia or Vietnam have also been showing extreme growth in the past year. Major American airlines with significant fleet size were among the first to equip their fleet with an IFC solution, and few remaining aircraft in this region are not connected or have not committed to an IFC solution. A major part of the American market is connected through ATG, as this solution has been available for many years in US airspace. 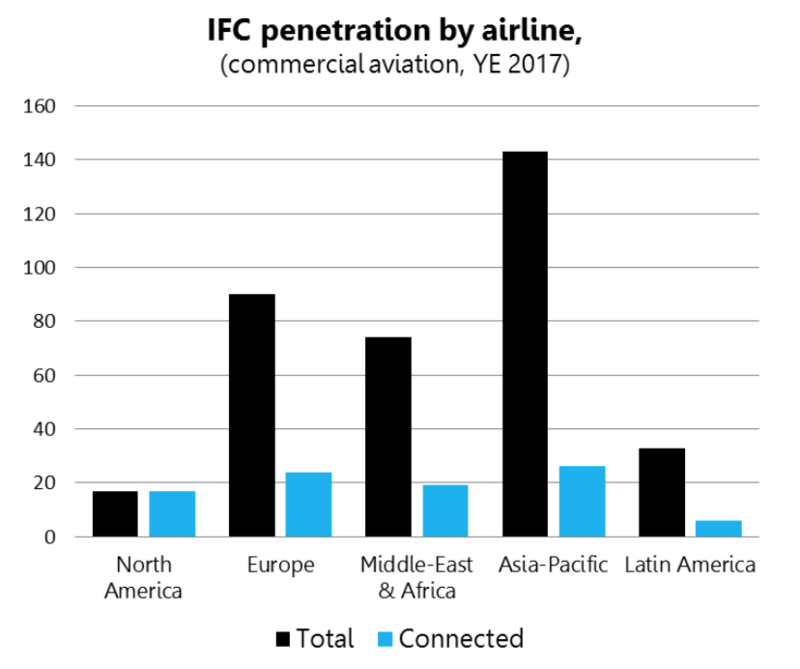 The European market is gaining maturity in terms of IFC penetration, with the biggest European airlines having committed to, though not yet installed, an IFC solution. European low-cost carriers, several of them operating fleets of more than 250 aircraft, are exceptions, as their business models have prevented them from installing costly IFC solutions. 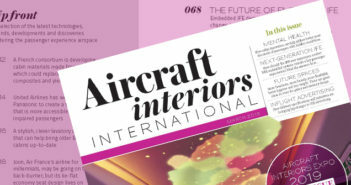 Numerous European carriers, with fleets of between 50 and 100 aircraft, represent an untapped market for IFC providers. Similarly, a significant number of airlines in the Asia Pacific market have not yet committed to a connectivity solution. Service providers are becoming more and more interested in penetrating this market, in particular since the beginning of 2018, as the regulatory environment started to become less stringent in China and India. Connected airlines have not yet found the perfect business model. As more and more airlines provide connectivity, offering in-flight wi-fi is starting to become a must-have in order to keep a competitive positioning in the extremely challenging airline market. Yet we still see some major airlines, operating fleets of more than 400 aircraft, that have not yet taken the decision to equip their aircraft. Indeed, it seems that, so far, the IFC economic model has not proven positive for airlines and operational connectivity costs are usually considered a burden. Airlines earn an average margin of US$9.13 per plane ticket sold, which leaves only a thin buffer against cost increases, shocks or changes in the economic environment. Inflight connectivity costs may even reduce this margin. Airlines are still trying to find the right balance between different factors such as the cost per MB paid to the service provider, the willingness of the passenger to pay, and the overall take-rate.The graph on the left shows the relation between the number of data plans applied by airlines and the price per MB charged to a passenger. 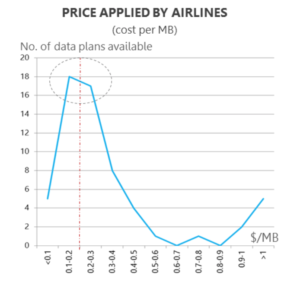 In most data plans, the average price charged to a passenger is set on average around $0.20 per MB. The amount per MB charged by the service provider to the airline is normally higher than this amount, resulting in a negative IFC related balance sheet for the airline. The total estimated backlog at the end of February 2018 was around 5,300 aircraft. This figure gives a good indication of how the market will evolve in the next 3 to 5 years. Similarly, the satellite operators market is expected to become more competitive with an exponential increase of capacity supply in the next five years. Hence, the price of capacity is likely to decrease significantly. However, this price drop will have little impact on the evolution of the ARPA (Average Revenue Per Aircraft) as ARPA will be mainly driven by the significant increase in aircraft bandwidth consumption. The ARPA for commercial aviation for VSAT is estimated to be around US$150,100 per year at YE 2017 and is expected to follow a steady increase with almost a 10% CAGR over the next 5 to 10 years. It may reach a plateau and stabilize when the market reaches a better level of maturity. The ability to provide airlines with flexibility so they can master and customize their offer to find the perfect answer to their passengers’ needs is one of the key criteria when opting for a connectivity solution. 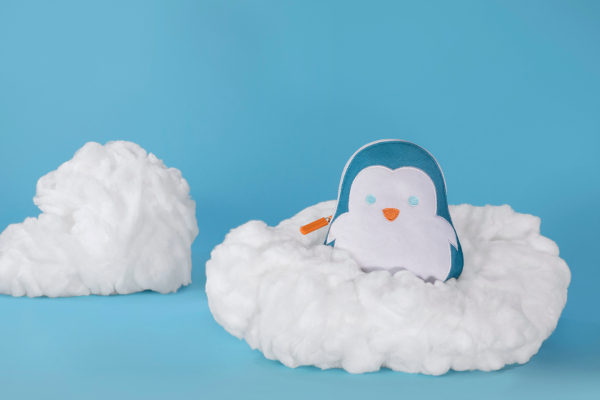 The financial equation for in-flight connectivity is rarely beneficial for airlines, and they are looking for alternative business models which could lighten the financial burden of connectivity. Although connectivity comes with a significant cost, many airlines consider that this choice brings a competitive advantage over other airlines competing over the same routes. Offering connectivity is seen as a way to enhance an airline’s brand image today. Beyond cabin connectivity, the next 10 years will see the full emergence of the SmartPlane concept. Aircraft being more and more connected will start to support all the latest IT trends, such as IoT, big data, analytics, cyber-security and so forth. The intensifying competition among the different stakeholders of the IFC value chain to offer more bandwidth to the aircraft will allow aviation to enter a new era with connectivity as its heart. The above subjects and more will be discussed and debated by the most influential leaders in the IFEC community during a series of roundtables at SmartPlane in Paris on September 10. SmartPlane is a unique event. Taking place in executive club-like surroundings with high-level social events, the Summit creates the ideal environment in which the 150 executives in attendance can learn about market dynamics, hold informal business discussions and shape the future of connected aircraft. For further information, visit www.smartplane-summit.com.